My first time fishing Montana was something of a revelation. My buddy and I were on a weeklong camping trip to Yellowstone National Park. With the famed Madison River in Montana such a short drive away, we made certain that we took time to fish it. The first day was tough as it can often be on new water, but the evening hatch more than made up for it. Fish rose until we couldn’t see anymore. The next morning, we returned and changed tactics. Streamers accounted for 20”+ brown trout for each of us. Ever since that first magical trip, I always try to make time to fish some of the best water in Montana anytime I am close. 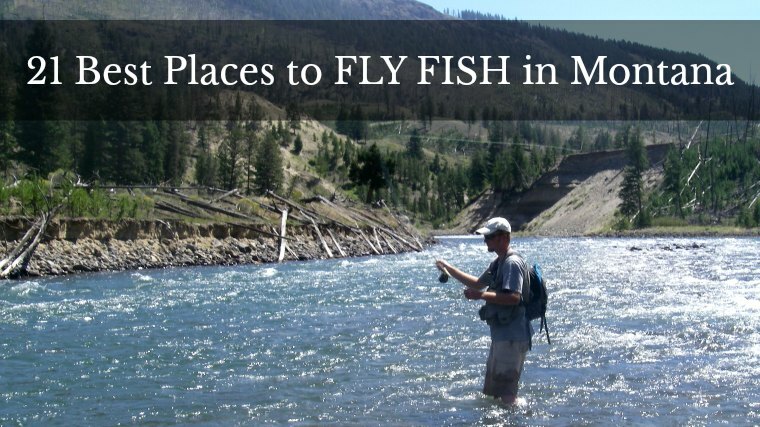 Montana may well be the very best state for the fly angler. The sheer volume of incredible trout water guarantees that. The state’s enlightened stream access laws are angler friendly making it easy to find a good place to fly fish. With some of United States’ very best scenery to go with the amazing fly fishing, Montana is a must fish destination for any serious angler. The following are the best of the best, but don’t forget to get off the beaten path and find those hidden gems as well. Most of Montana’s best trout streams eventually find their way to the Missouri. Originally explored by Lewis and Clark, the Missouri River has a long history as a major gateway to the western United States. While the explorers didn’t find the hoped for water route to the Pacific, they did discover one of the best trout streams in the country. Today, angler’s come from all over to try for the large rainbow and brown trout that call this river home. This river is famous for its dry fly fishing so come prepared to sight fish to big trout. The Missouri River is a true bug factory. We recommend a well-stocked fly box for success. Here are a few of the flies you shouldn’t leave home without. One of the major tributaries of the Missouri, the Yellowstone River also happens to be one of the best trout streams in the country. With its headwaters in Yellowstone National Park (see #21), the Yellowstone River flows north out of Wyoming and into Montana as a world class blue ribbon fishery. It also happens to be the longest free flowing river in the contiguous United States. Cutthroat, rainbow, and brown trout make up the majority of the catch on this river. Add in numerous hatches providing good dry fly action and you have a fly angler’s dream. Access is excellent all the way from the Yellowstone National Park Boundary down through Paradise Valley and beyond. Due to the river’s large size, float fishing is probably the best bet although walk and wade anglers can find fish as well. Overall numbers of trout begin to decline as you head downriver from Livingston although there are some large trout and even a few sections that still have high densities. If you are looking for the famous Yellowstone cutthroat trout, keep your fishing closer to Gardner. Rainbows become more common as you head downriver, especially as you enter Paradise Valley. Hebgen Lake is a special trout fishery. It provides a winter and summer habitat for many large rainbow and brown trout that move in and out of the Madison River in Yellowstone National Park to spawn. When these fish are in Hebgen, they provide opportunities for sight fishing cruising risers on calm days. These gulpers are feeding on callibaetis mayflies as well as tricos depending on what’s hatching. A boat or float tube is ideal to get you out to where the fish are. Remember to bring long leaders as these fish get spooky! There are plenty of access points to launch a boat on Hebgen. Good shoreline to walk and wade are more limited but not impossible to find. We recommend serious anglers stick to the Madison or Grayling arms of the lake. As boat traffic can be heavy in other areas of the lake. The Madison River begins in Yellowstone National Park at the confluence of the Firehole and Gibbon rivers. This upper section is like a giant spring creek. Once it enters Montana, it flows through Hebgen Lake. The short tailwater below the lake is excellent, but our favorite fishing is downstream of Quake Lake. The famous $3 Bridge wade access is always crowded, but there is good reason. The large rainbow and brown trout along with an occasional mountain whitefish will keep you entertained for days. Evening caddis and mayfly spinner falls in the summer are worth staying out late for. The Madison is sometimes called the 50 Mile Riffle. This makes it ideal for fly anglers. Downstream from $3 Bridge, much of the river can be accessed and fished by float anglers. All the way to Ennis Lake is worth exploring although you won’t have the river to yourself. Below Ennis Lake, the river flows through the famous Beartrap Canyon. Access is difficult but the fishing can be good to excellent for adventuresome anglers. This section has many crawfish, so bring some imitations and target the larger trout that live here. This classic freestone is close to Missoula. This is one of the best rivers in Montana for wading anglers. Not too small and not too big, this just right stream provides lots of access as it flows through many miles of National Forest land. Because of the tumbling nature of Rock Creek, stoneflies are plentiful including the salmonfly hatch that brings anglers from all over. Yellow sallies are also plentiful. Evening caddis hatches can be fantastic as well. Expect cutthroat and rainbow trout in the upper reaches with a transition towards rainbow and brown trout in the lower stretches of Rock Creek. Known for jumbo sized brown trout, the Beaverhead is a surprisingly small river considering the size of the fish that live there. The majority of anglers head for the upper river immediately below Clark Canyon Dam. This section gets crowded and has special regulations on float access so check the current regulations for more info. Small nymphs and light tippets are the key to success here. Streamers can also sometimes attract those big browns. The best way to find success on this river is to hire a guide and float. The lower Beaverhead suffers from summer drawdowns due to irrigation demands. Thus, it is fished less than the rest of the river. This makes it a good sleeper stream. While trout numbers are not as high, if you hit it right it won’t matter. Cool rainy weather can be a good time to fish this lower section. Although these are mostly all privately owned making access somewhat pricey, the fishing is worth the price of admission. Heavy hatches of mayflies like pale morning duns bring seemingly every fish in the stream to the surface. Because these are spring creeks, they are extremely nutrient rich. Large rainbow and brown trout are common although hooking and landing them can be challenging. These streams make a great day trip if you are staying in Livingston or Gardner and fishing the Yellowstone River. Bring light rods, long leaders, and fine tippets for these educated trout. Located in the southwest portion of Montana, the Bitterroot River is conveniently located reasonably close to Missoula. The scenery here is spectacular. This river is not as pressured as some Montana waters although does get its fair share of anglers. Rainbow trout are the main quarry on the Bitterroot although some cutthroat and brown trout can be found as well. With good hatches, the dry fly angler will particularly enjoy this river. Early season fishing during the skwala hatch is particularly good. However, the river fishes well throughout the warm months. Green drakes in late June and July are a special treat as well. Brown drakes can also be found hatching about the same time. Tricos in late summer into the fall bring some of the most technical fishing of the year on this trout stream. Another lake located on the Madison River, Ennis lake also offers some great fly fishing. The whole lake is quite shallow making fly fishing the method of choice. Gulpers can be found cruising here just like on Hebgen Lake. Fishing to these risers out of a drift boat with callibaetis or trico imitations provides consistent action as long as the wind is not blowing too hard. Many of the large trout in Ennis Lake migrate upstream to spawn. Nailing down the specifics on this run is tough, but if you hit it right you might catch the brown trout of a lifetime. A particularly good plan is to fish the lake in the morning until the winds pick up. Once it gets breezy, the chop on the lake surface makes it tough to dry fly fish. Head out to fish the Madison River for the afternoon. Even better, take a break during the heat of the day and fish the evening hatch once other anglers have left the river. The history of fishing the Clark Fork River is one of a dead river due to runoff of mining waste. Thankfully, this issue has largely been addressed through ongoing Superfund cleanup efforts and the river is being revived. The far upper river is much like a spring creak. Here, brown trout dominate and access is tough. The narrow stream presents its own challenges but plenty of fish make the effort worthwhile. Probably the best section is closer to Missoula below where Rock Creek and the Blackfoot River adds cool water into the river during the heat of summer. Upstream of that, low flows due to irrigation can wreak havoc on the trout numbers. You will find rainbow, brown, and a few cutthroat trout here. This is one of the premier wilderness fly fishing destinations in the lower 48. The South Fork of the Flathead River begins and flows through the Bob Marshall Wilderness. The river provides epic fishing for native cutthroat trout along with some rainbows. Because the river flows through wilderness, you will have to walk to get to the stream. Backpacking or a horse pack trip is the best way to fish the South Fork of the Flathead. Many grizzly bears call the wilderness home so take appropriate bear precautions. As with most cutthroat trout, standard attractor dry flies from size 8-16 are best. Their willingness to attack dry flies is what makes the cutthroat an angler favorite. The big treat here is that you can also fish for bull trout. This is one of the only places in Montana where it is legal to do so although there are some limitations. Check current regulations if you intend to target bull trout to make sure that you stay legal. All bull trout caught are strictly catch and release. Bring a heavy rod and big streamers for the bull trout. People don’t really go to Glacier to fly fish. That is really the point though. Don’t go here for the fly fishing. However, once you arrive at this jewel and are blown away by the scenery, think about how nice it would be to fly fish in such amazing surroundings. There are both lakes and streams here. Bull trout can be found, but most of the fishing here is for native cutthroat trout. The National Park Service does have special regulations including seasonal and permanent closures on certain stretches. Stop by a park visitor center to get a current copy of the regulations. Don’t get too focused on your fishing. Stop to enjoy the scenery as often as possible. Also, keep an eye out for the grizzly bears that call the park home. A nearby option that runs under the radar is the Blackfoot tribal lands on the east side of Glacier National Park. Check out the lakes there for potentially enormous trout. The rainbow trout are normally measured in pounds there with ten pound fish a distinct possibility. This is the river for anglers looking to avoid the crowds. The Jefferson River is one of the three main tributaries of the mighty Missouri River and also happens to be the least fished. This is probably because of the lower overall fish counts on the Jefferson. That said, it can provide memorable fishing opportunities if you take the time to fish it. The low pressure can also be attributed to the more remote nature of this river. It is a further drive from places like Bozeman than the Madison or Gallatin. Consider streamer fishing on the upper Jefferson if you like targeting large brown trout in tight structure. The Ruby River has two distinct sections, the upper and lower. The upper Ruby River originates on National Forest lands and provides good fishing for small to medium sized rainbow and cutthroat trout. You may also find an occasional grayling here. Once the river exits the National Forest, access becomes quite difficult with less than cooperative landowners. Remember that by Montana law, you can access the river below the high water mark. Since this is often ambiguous, it is best to stay in the actual stream if you choose to fish through private water to avoid problems. Below Ruby Reservoir, the river becomes an excellent brown trout fishery. The fish are a bit more willing here than on some other Montana Rivers. Angling pressure is lower here which probably helps. The lower Ruby River provides some of the best hopper fishing opportunities in Montana. Browns will ravenously attack hoppers for most of the summer into early fall. As with the upper river, anglers will probably have to stay in the river if they want to get away from access points. The banks are generally overgrown and impossible to navigate. This major tributary of the Jefferson River offers something for everyone. The river contains rainbow, brown, brook, cutthroat, and brown trout. The Big Hole River is also one of only a few places in Montana where you can catch native grayling. Whitefish are also present as in most Montana rivers. Some sections of the Big Hole provide excellent access for wading. Floating is another good way to enjoy this beautiful trout stream. Dry flies are often the best choice on this perfect fly fishing river. The Gallatin is another great trout river with its headwaters in Yellowstone National Park. While the park stretch is well worth exploring, the best fishing in Montana occurs further downstream. This, along with Rock Creek, is a favorite with wading anglers. That is because float fishing is not allowed on a majority of the Gallatin River so waders will have the river to themselves as far as the fishing is concerned. Below its junction with the East Fork of the Gallatin, float fishing is allowed. However, since access is quite limited, floating is really the only way to fish this lower section. The Gallatin is a fast flowing river with a high gradient. Coming out of the high mountainous region of Yellowstone, it flows very cold throughout the year. The best fishing is usually from early to mid July through mid September in most years. Rainbow and brown trout are your main targets although cutthroat and grayling can be found as well. You will also probably hook some large mountain whitefish if you choose to fish nymphs. The good news is that the Gallatin is a premier dry fly river. Standard attractor dry flies are often the best approach on this fine trout stream. Don’t forget some spruce moth patterns as they are particularly plentiful on the Gallatin. Another of Montana’s world famous fly fishing destination rivers, the Bighorn begins in Wyoming before it flows north into Bighorn Lake. Below Yellowtail Dam, the Bighorn River tailwater provides world class fly fishing for rainbow and brown trout. Looking to catch good numbers of trout? Then the Bighorn is for you. Want to catch big fish? Check. As a tailwater, the Bighorn fishes very well on standard tailwater patterns. Midges, worms, and scuds are staples. The good news is that this river also features phenomenal mayfly and caddis hatches along with some stoneflies. Summer pale morning duns in size 14-16 along with evening caddis in 14-18 will keep the dry fly connoisseur happy all day. Fishing the Bighorn River is a bit of an undertaking. Because it is not close to other famous Montana waters, a trip to the Bighorn is a dedicated single destination trip unless you have an abundance of time. Plan to fish several days and make a trip of it. The only natural lake on the Madison River, Quake Lake was formed by a strong earthquake in 1959. The earthquake set off a huge landslide that dammed up the Madison River and created the lake. Standing dead trees are found throughout much of the lake. A boat is the best way to fish this lake although some of the shoreline is accessible. The rainbow and brown trout here can grow to large sizes. The best time to target them is during the annual salmonfly hatch. Fishing huge dry flies among the standing dead trees can be epic. The Smith River is unusual because of the limited access and restrictions on the number of boats allowed to launch each day. To be able to float the Smith River, you have to enter a drawing for a permit and hope you get one. If you are one of the lucky few, then you get the privilege of a multiday float trip through some of the most beautiful scenery around. The fishing can be pretty good as well. Rainbow and brown trout dominate although a few brook trout can be found in the upper reaches. Use streamers to target the brown trout in the river. If you get the opportunity, make an effort to hit the salmonfly hatch here. It is probably the best fishing of the year. These two lakes are found close to the Madison River at $3 Bridge. If you take the time to drive up the gravel road there a few miles, you will discover two of the most beautiful mountain lakes in Montana. The trout grow large here. The Montana state record brown trout was caught in Wade Lake and was nearly 30 pounds. These crystal clear lakes offer sight fishing opportunities to cruising trout although most fishing is done subsurface. Callibaetis and midges are the main bugs here. Leeches and crawfish patterns fished on sinking lines are best if you want to get down where the big trout are. You will want some type of watercraft if you are planning on fishing these lakes. A float tube or canoe is probably best. Only a small sliver of Yellowstone National Park is actually in Montana. That’s close enough for us though. The Park itself could keep a fly angler busy for the rest of their life. Anyone who is already in the vicinity owes it to themselves to spend at least a day or two here. Yellowstone is about wildlife viewing, geothermal features, and yes, the fishing. Rainbow, brown, brook, cutthroat, and lake trout are all found in Yellowstone along with grayling and mountain whitefish if you know where to look. Do yourself a favor and fish the fall run on the Madison River sometime. All those big lake fish head up into the Park waters starting in late summer. The run gets stronger as you get deeper into fall. The best fishing usually coincides with the worst weather in mid to late October. Come prepared for true winter fishing conditions. The northeast corner of the Park is also a treat. Stay in Cooke City Montana and make the short drive into the Lamar Valley. Here you can fish such famed waters as the Lamar itself, Soda Butte Creek, or Slough Creek. The Yellowstone cutthroat trout are plentiful here and will often rise to a well-presented dry fly. Terrestrial fishing in mid to late summer can be awesome. Of course, the Yellowstone River within the National Park is a must fish. Native Yellowstone cutthroat abound here and are normally easy to catch. If you want to fish on Yellowstone Lake, remember you have to kill all lake trout caught. These non-native fish have significantly affected the native cutthroat population and the Park Service goes to great lengths to remove as many lake trout as possible. For most of your fishing in Montana, a standard fast action nine foot five weight fly rod is best. A weight forward floating line will work for most applications. If it is windy and you are fishing big water, a six weight might be a good idea to bring as well. If you intend to fly fish with streamers for larger trout, then a seven weight fly rod with sinking or sink tip line is a good choice. On the lakes, sinking line will help in the deeper water. However, if you want to target those cruising gulpers, then a four weight might be best. The fish are quite spooky at times and so the ability to have a lighter presentation is ideal. The same goes for the spring creeks as well where three or four weight rods are best unless it is unbearably windy. If you are planning on spending a lot of time on streams like the Gallatin or Rock Creek, a longer rod might be a good idea for the extra reach. A ten foot three weight or four weight is an excellent choice as long as the wind is not blowing too strong. Make sure and bring plenty of flies to match a variety of hatches. Pale morning duns size 14 and 16 hatch on most Montana rivers and streams. Caddis are also very prevalent. Tan and olive caddis in size 14-18 should cover most situations. Salmonflies, golden stoneflies, and yellow sallies are found on many streams and rivers. For the lakes, make sure you bring callibaetis and trico patterns as well as some leech and crawfish patterns. Bring a variety of leaders and tippet material. If you are dry fly fishing, then you will probably want long leaders on many rivers and lakes. Twelve to fifteen foot leaders ending in 5x tippet is typical on several of these waters. Depending on the time of year and flies you are throwing, you might be able to go heavier. On their website, you can find information about fish stocking, regulations, and buy your fishing license. There are many excellent fly shops across Montana. Here are just a few of our favorites.